Dental sealants are thin, plastic films painted on the chewing surfaces of the molars and premolars. Sealants are highly effective in the prevention of tooth decay (caries and cavities). 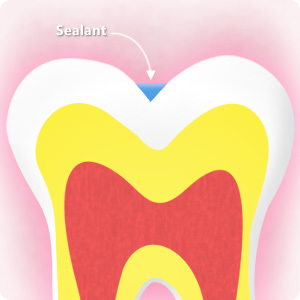 Dental sealants are particularly effective on the back teeth, as the back teeth contain more hard-to-reach pits and grooves that serve as a host to food debris and plaque build-up. Because sealants act as a physical barrier to decay and plaque build-up, in most cases, they provide excellent protection. Sealants are especially beneficial for children because their newly erupted, permanent teeth are the most susceptible to cavities. The procedure starts with cleaning the surface of the tooth, rinsing the surface to remove all traces of the cleaning agent, and drying the tooth. A solution or gel is applied to the surface of the tooth, including the pits and grooves, to make the surface of the tooth bondable. After several seconds, the solution is thoroughly rinsed away with water and the site is dried. The liquid sealant is then applied and cured by a blue light. With proper oral hygiene, sealants are of great preventative benefit.